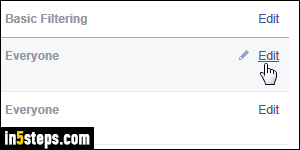 By default, there are several ways you can find people on Facebook: most often, you search by the person's name, but it's also possible to find people by typing an email address in the search box. That's especially useful when searching for people with a common name (say, "John Smith"). 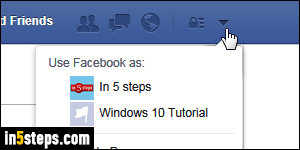 But I'll show you how to hide your email address from Facebook's people search function. Another common use of finding people by email address is when Facebook lets you import address books from popular webmail providers (Gmail, Yahoo Mail, Hotmail / Outlook.com, AOL Mail...) to easily find your friends on the site. If you want to be more easily found, you can change your name, which includes adding a maiden name, nickname, or an alternate spelling of your name. 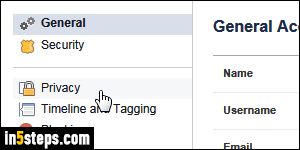 Once logged into your Facebook account, click on the dropdown arrow in the top right corner of the page, and select "Settings" from the menu. The General options are automatically selected: click "Privacy" on the left. Under the third section, "Who can look me up? ", click on the Edit link on the right of "Who can look you up using the email address you provided?" Click on the dropdown menu that appears below, and pick from one of three values. 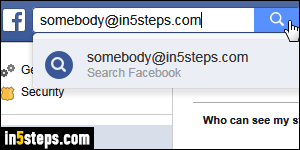 - "Everyone", the default, means that anyone with a Facebook account can search for your email address, and find you - even if you've changed name. 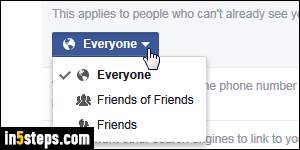 - "Friends of Friends" means that both your friends (who'd probably not search for you anyway!) and their friends can find you by email address. - "Friends" essentially makes your email address private / hidden from search, since you'll be invisible to anyone you haven't befriended or kept as friend!